It didn't take too long for everyone's brackets from last week to fall apart. 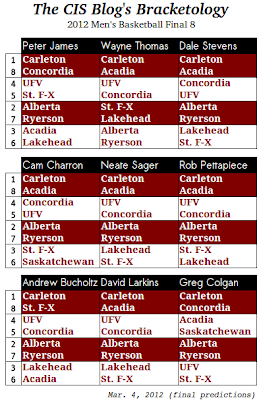 We all had Lakehead and Saskatchewan; now, only one of those teams can advance. A fourth-place finish by UVic pushed them off six of the nine ballots, and needless to say nobody had Ryerson winning Friday night. St. F-X is as high as second and as low as eighth. Acadia, same deal: from No. 3 to No. 8. According to us, Alberta and Ryerson will always play each other in the quarterfinals, as will Concordia and Fraser Valley. "The waiting is the hardest part ..."
I love that the CIS sends a tweet, telling us the announcement will be "coming out soon" ... in the time it took to type the tweet, they could have typed the seeds! pretty nervous right now lol...... how can sask not get it? True, but if Ryerson had played the whole season with the lineup they had Friday night, they would have rolled through this season. They will be scary good next year. We were all wrong, but I guess Dale wins by default. The CIS has nine criteria that it uses for at-large selection. It's pretty cut and dry. How can Sask not get it? Because the Huskies lost on 6 of those 9 criteria. It had nothing to do with one loss on the last weekend of the season and everything to do with all the other results that go into a season. While it may be "cut and dry," the criteria used is also inherently flawed. It makes a major assumption that all conferences are equal and they are not. Strength of schedule does not enter the picture, but it should. Note: Five out of the top 8 CIS-ranked teams hail from the Canada West. That should be considered when deciding on an at-large berth. Yes, you betcha, Saskatchewan got hooped.